All boat rentals include Free lifejacket rental. Everyone in the boat must have a lifejacket in the boat with them. Lifejackets by law, must be worn at all times by anyone 12 years old or younger. You must be 18 or older to rent a boat. Children may take a boat out on the water, but an adult needs to rent it out. 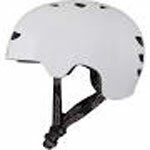 All bike rentals include a bike helmet. 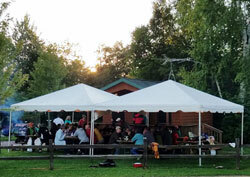 - Minimum 2 hour rental - All 2-12 Hour rentals are due back to store by 9:00 p.m.
Are you camping with a large group or hosting a family reunion while camping at Indian Trails? 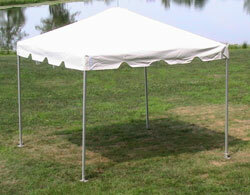 If so, we offer commercial grade party tent pavilions with optional sidewalls for rent. 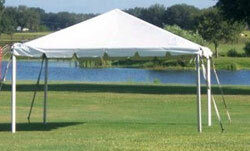 The rental price includes delivery, setup, and teardown so you can just sit back and relax while we do the work. Save time, money and gas by storing your RV at Indian Trails Campground between your camping visits with us. The first 14 days of storage in the west storage area is FREE, and each additional day after that is only $1 per day. A storage agreement is required to store your RV in the west storage area.